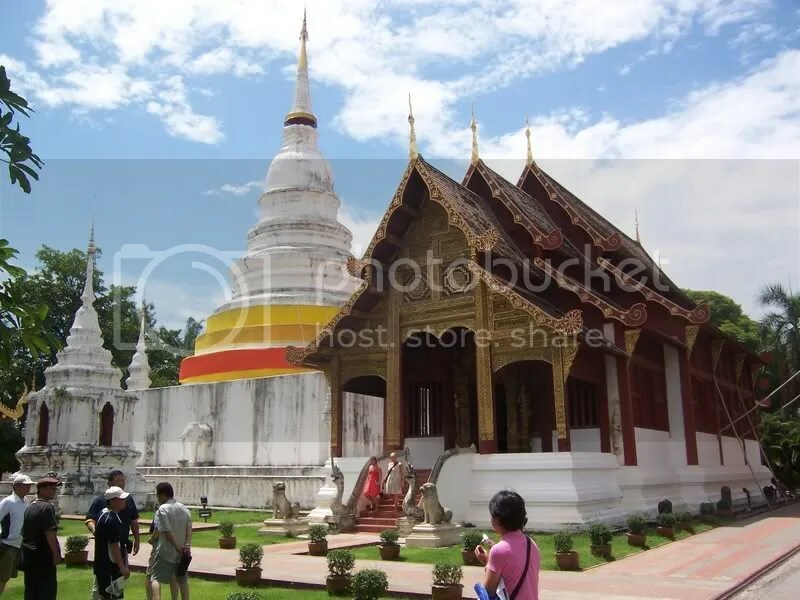 It was the opposite of a shock to return to Thailand after my time in Laos – not pleasant familiarity, but an easiness that doesn’t fit in that well with my idea of travel, whatever that is. Not that anything went badly, just that there was a certain sense that from this point onward I was on the proper tourist trail. This was something I’d anticipated, and this was one of the reasons I decided to try out the Couchsurfers website, an online community in which travel types link up with each-other to provide free accommodation. My host was Eric, a Malay guy with a Thai wife, who lives in a small village outside Chiang Rai. I was just there for a night, and had a good chat with the guy, before setting out the next day for Chiang Mai. On the way there was an afternoon to spend in Chaing Rai, not a bad little provincial capital, though not one with more than enough sights for a day. 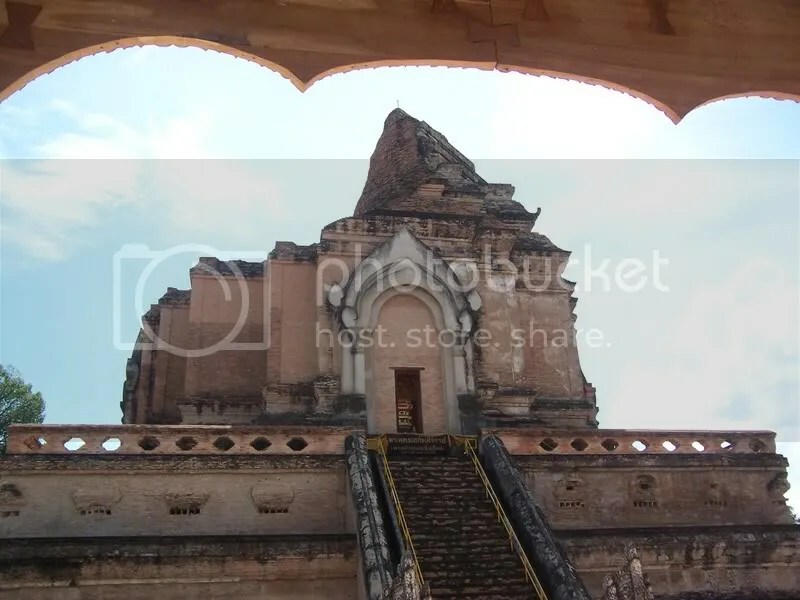 There were some nice temples I almost happened across, of course – this one came out particularly well. 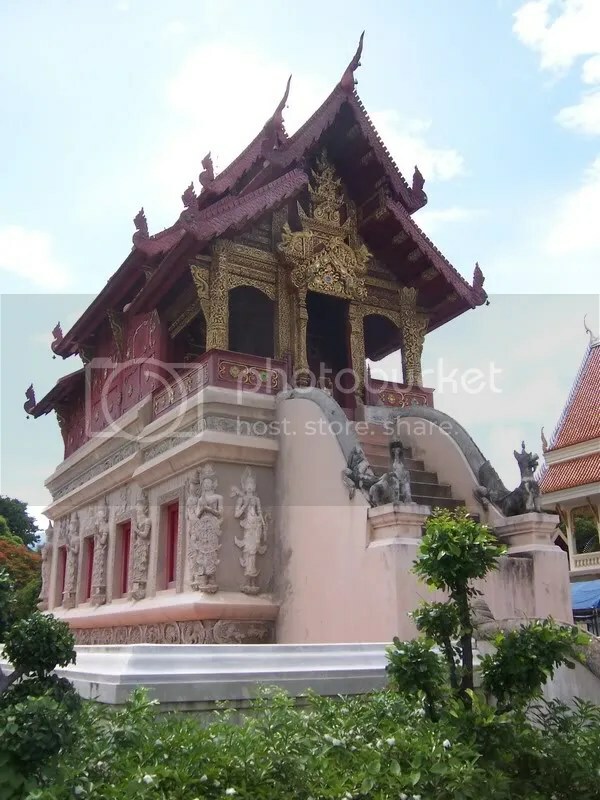 All the same, I was getting Temple Fatigue, something I would develop into a fine art within days. Seeing Angkor halfway through the trip could well have been a mistake as everything after was bound to be a step down. 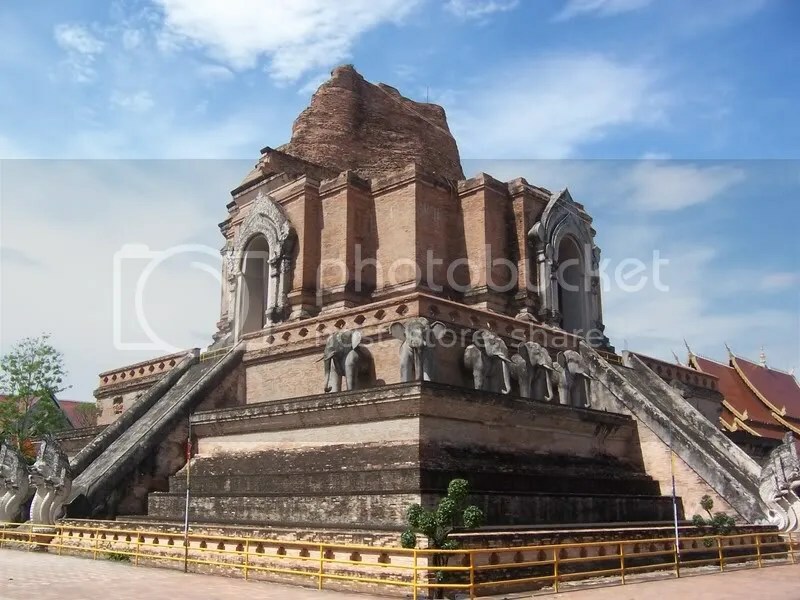 I picked the cheapest bus to Chiang Mai, and didn’t regret it until the realization that the night was drawing in and the windows were all wedged open, leading to another journey mainly spent shivering. 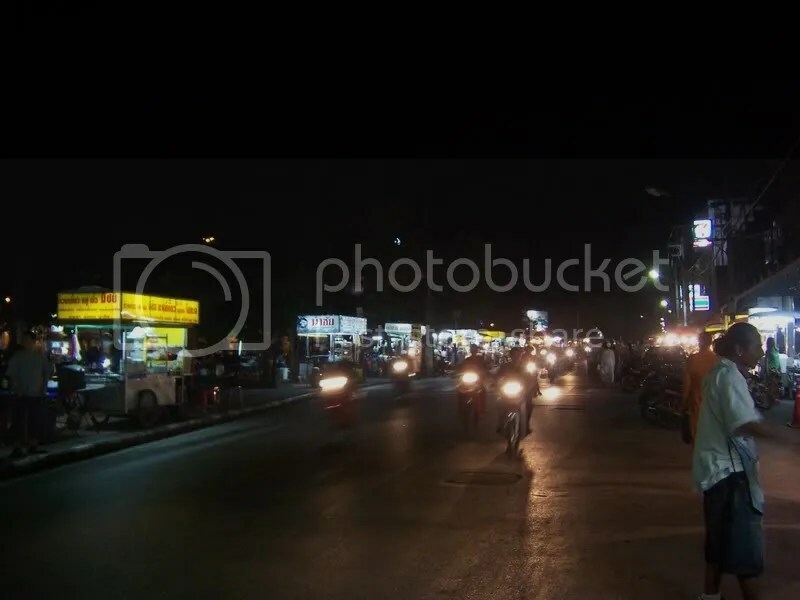 It was 11pm by the time we arrived, and an expensive tuk-tuk took me down to the centre, where I found every place with a dorm either fully booked or closed up for the night. Eventually I came across a basic hotel with a moderately priced room. There were another two and a half days in the city, though I didn’t do much. Superficially the place was fairly nice, but for some reason I just didn’t enjoy my time there. Maybe it was the T.F. – I deliberately overdosed on temples the first day to leave myself a day free for… what? I forget. There were some very nice ones, all the same. My favourite was this one – a vast semi-demolished shape which would have seemed much more at home at the end of a jungle path rather than in the backstreets. It was so hot at this point that I feared going into the sunlight for even a minute with my pasty, burnable skin. These, and other pictures, were taken either from the shade or from a brief dalliance into the sunshine. Aside from temples Chiang Mai has an apparently famous but not particularly interesting night market, with food. On the way back I spotted a man with a baby elephant. 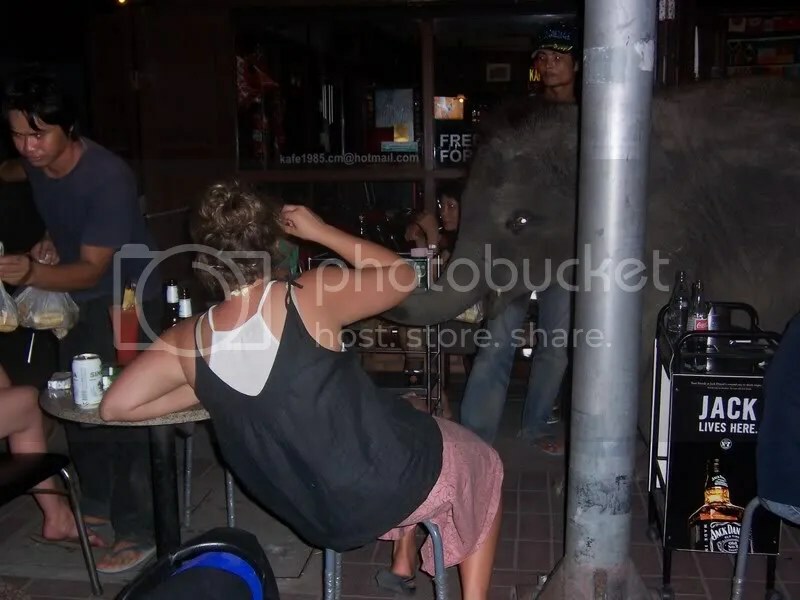 His business plan seemed to involve stopping at bars, letting the elephant eat tourists food, then waiting until someone gave him money to take it away. 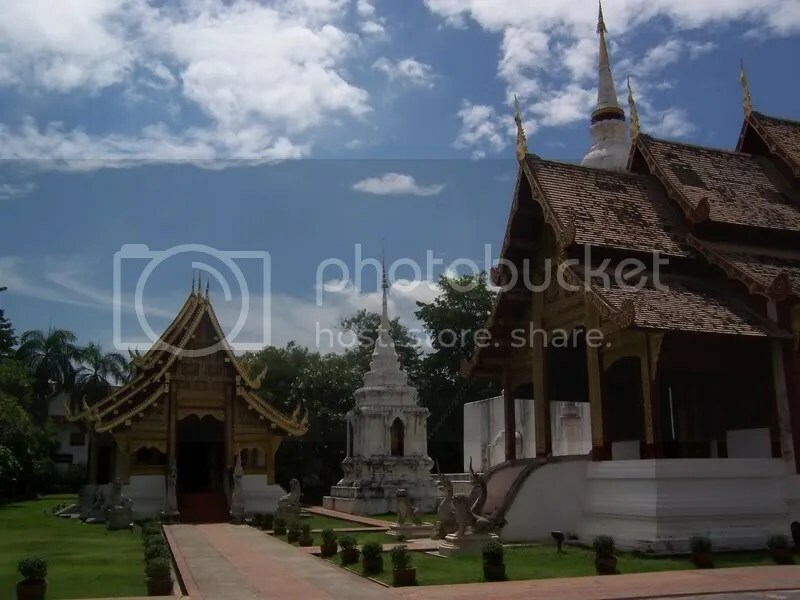 There’s a very famous temple complex just outside Chiang Mai, which I spent the best part of a day trying and failing to get to. The quoted price in the tourist guides is about 80p, but the parasitic tuk-tuk drivers have entered into some kind of cartel to jack the price up to £10. After a few hours being carted around trying to find one reasonable businessperson in the entire city I got angry, for the first time on the trip. 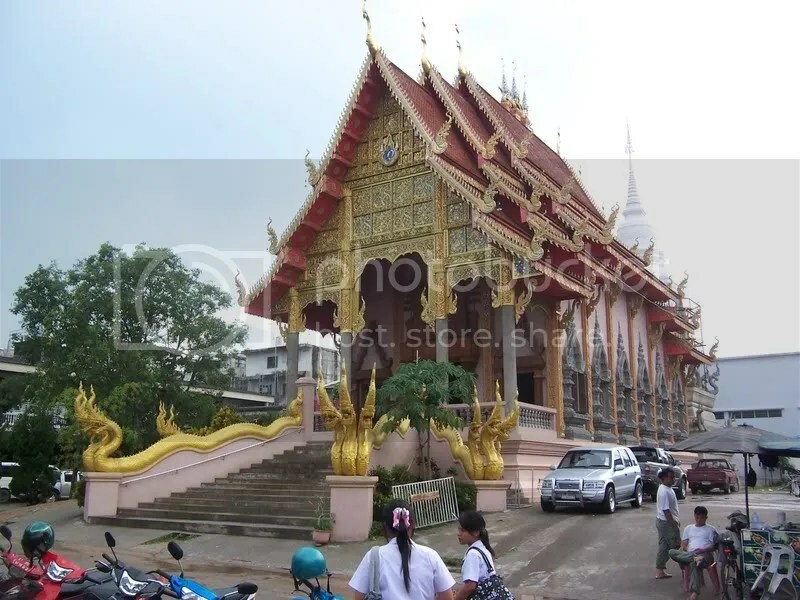 I swear that the people operating transport in Chiang Mai are the most unpleasant shysters to be found in any walk of life in the whole of South-East Asia. I don’t know if it was this that left a bad taste in my mouth, but I certainly departed with a negative view of the admittedly attractive place. This is what it means to be ruined by tourism – the creeping feeling that everyone you speak to is trying to sell you something, and for many times what it’s worth. That’s not fun. Leaving for Pai was a good idea at this point. Adam had recommended I go there and I probably wouldn’t have heard of it otherwise. The only transport was another old bus, so I took some slightly warmer clothes, but the problem this time wasn’t cold but coach-sickness. The road we took must be one of the most ridiculously windy in the world, and the bus engine was ill-equipped to manage it. There wasn’t really anything to do or see in Pai, which turned out to be an absolute blessing. It was exactly what I needed – a break from the T.F. and the salespeople with no little voice telling me I have to do something or see something. What there was was a good selection of restaurants selling excellent Thai food – Na’s kitchen in particular sold Thai curry so good I can’t begin to describe it – and some decent bars where expats, travellers and locals all drank, mixed and had fun in a way unimaginable in regimented tourist-spots like Chiang Mai. 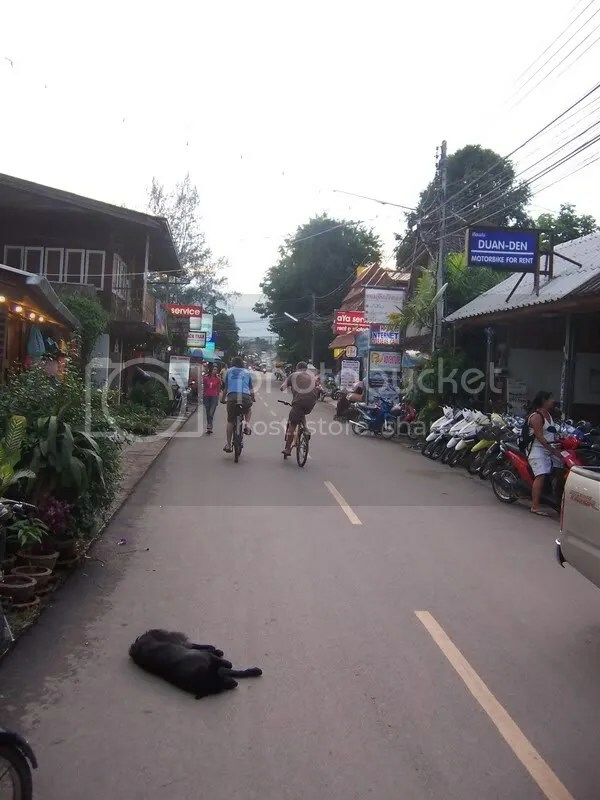 The place was at the same time small and sleepy enough that a dog could feasibly sleep in the middle of the main road in the middle of the afternoon. My room was a hut which cost £1.50 a night, amazing value for Thailand. In the daytime I lounged around here with the cats. 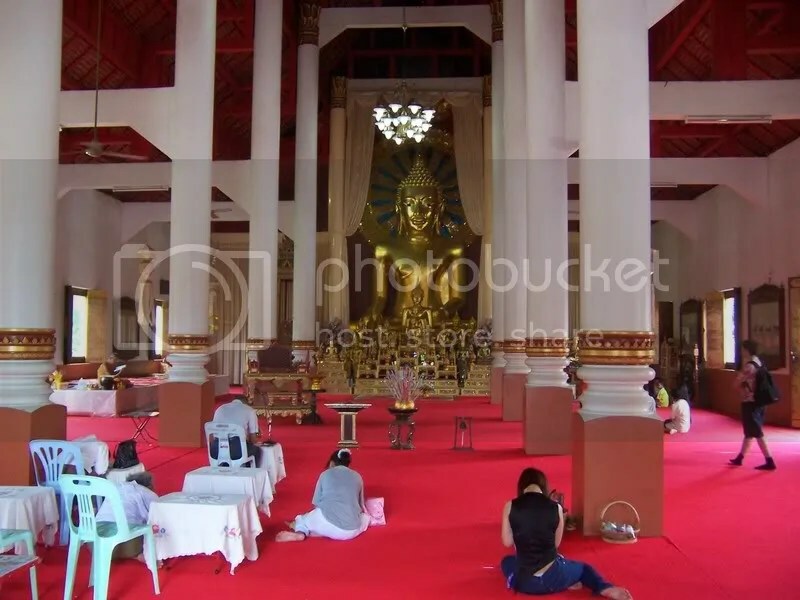 After three or four days my time really was running out, and my appointment with South Thailand touristland was due. 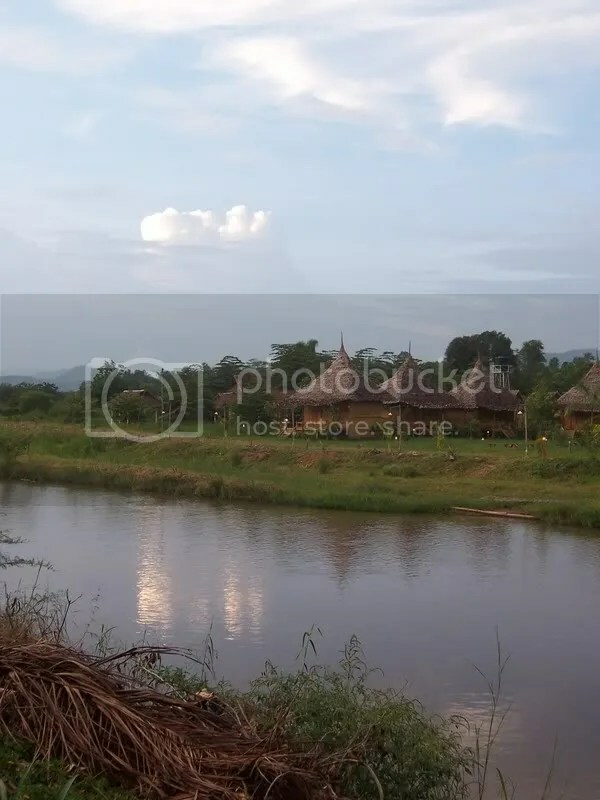 This entry was posted in diary and tagged photos, thailand. Bookmark the permalink.